Location: Cliffs of Moher in County Clare, Ireland. Notes: O'Brien's Tower marks the highest point of the Cliffs of Moher in County Clare, Ireland, located a short distance from the village Doolin, famous for its traditional Irish music. The tower is also located near Liscannor, a coastal village famous for its slate flagstones which were used for fencing purposes. 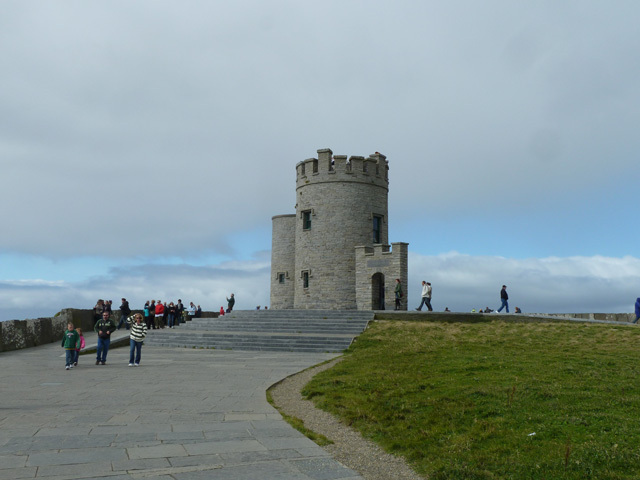 The tower was built on the cliffs in 1835 by local landlord Sir Cornellius O'Brien as an observation tower for the hundreds of Victorian tourists that frequented the cliffs at the time. Another version tells of O'Brien building the tower in order to impress women he was courting. On a clear day the view can extend as far as Loop Head at the southern tip of Clare and beyond to the mountains of Kerry. Looking north from O'Brien's Tower on clear days, the Twelve Bens in Connemara (also known as the Twelve Pins) beyond Galway Bay can be seen, and typically the Aran Islands to the west.Folklore holds that Sir Cornellius O'Brien was a man ahead of his time, believing that the development of tourism would benefit the local economy and bring people out of poverty. O'Brien also built a wall of Moher flagstones along the Cliffs and it is said in the locality that he built everything in the area except the cliffs. He died in 1857 and his remains lie in the O'Brien vault in the graveyard adjoining St Brigid's Well.